REUTERS/Stephane MaheAn aerial view of the Mistral-class helicopter carrier Vladivostok. French industrial group DCNS charged with delivering two Mistral-class helicopter carriers to Russia has agreed a new deadline of November 27th to hand over the first ship, according to Russian media reports. The deal, which is worth some €1.2 billion, appeared to run aground over Russia’s part in the ongoing Ukraine crisis. However, independent Russian news service Interfax reports a military-diplomatic source as saying that a deal has now been struck for the Vladivostok to sail out of Saint-Nazaire shipyard and arrive at its new home of Kronstadt by Friday. If true, the news will come as a surprise to many. French President François Hollande had set two firm conditions on the sale — a lasting ceasefire deal between the government in Kiev and rebels in the east of the country and a roadmap agreed by both sides that would put Ukraine onto a lasting path to peace. Neither of these appear to have been met. 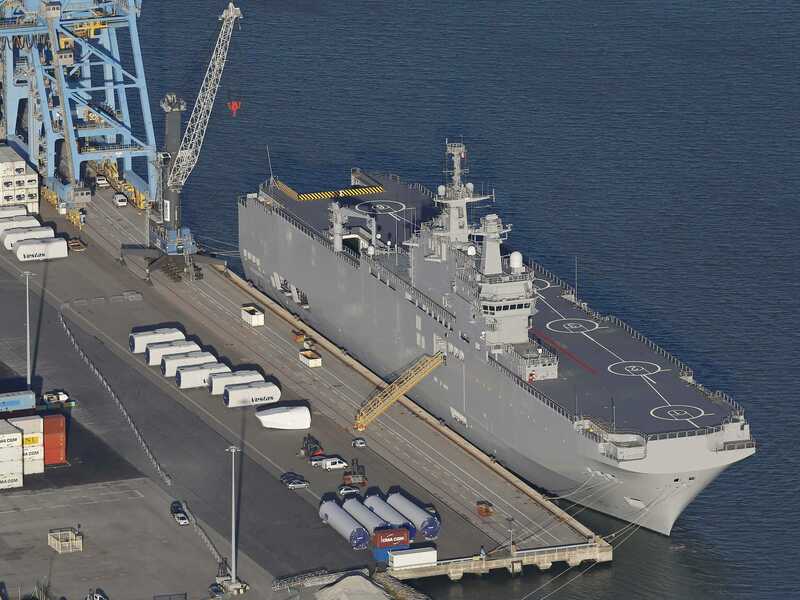 Indeed 10 days ago as the previous deadline of November 14th approached Manuel Valls, the French prime minister, stated categorically that the conditions for the sale had not been met stating that “the conditions to deliver the Mistral aren’t there”. So what’s happened in the last 10 days to change their mind? In short, very little. Over the weekend heavy shelling continued in Ukraine’s breakaway region of Donetsk, damaging two critical gas pipelines leaving around 5,000 residents without gas in their homes and wounding twelve people, according to the city council. Elections held in the rebel-held breakaway regions of Donetsk and Luhansk early in November helped inflamed tensions, with Ukraine’s government along with its supporters in the West refusing to recognise the result. Moreover, reports from NATO’s top commander that Russia has been moving troops and equipment across the border into Ukraine cast further doubts over the prospects of a swift resolution to the crisis. Despite this, reports that Russia had set a firm deadline of the end of the month for France to hand over the ship or else face “serious claims” may have prompted a sudden change of heart. If the French side were found to have breached its contract with Russia it could face punitive damages and the government may have decided that the costs now exceed the benefits of holding out on the deal. Either way, we should find out how this end of the Mistral saga is likely to play out in the next few days.